"Assisting you on your Ascension Journey to Mastery and Empowerment I am thrilled to be joining creative energies with some of the best Intuitive Vibrational Alignment and Intention Artists, Healers and Teachers on the planet to bring in high vibrational products, programs and services to assist you in living your best life now and support you in your joyful Life Purpose and Divine Service Work." This is really exciting!! I LOVE co-creating...and this co-creation, a very powerful Vibrational Alignment and Planetary tool for Earthkeepers and Energy Healers was a beautiful adventure. The mandala and it was then energetically activated by Jill Chesrow﻿ to enhance the Earthkeeper energy for those that carry the Soul Energy of Earthkeeper and to aid Gaia/Mother Earth/Pachamama in the transmutation of any and all disharmonious, misqualitifed energy as we continue to heal and move into Peace on Earth. Thank You Jill for the opportunity to co-create with you! You can learn more about Jill's work here. 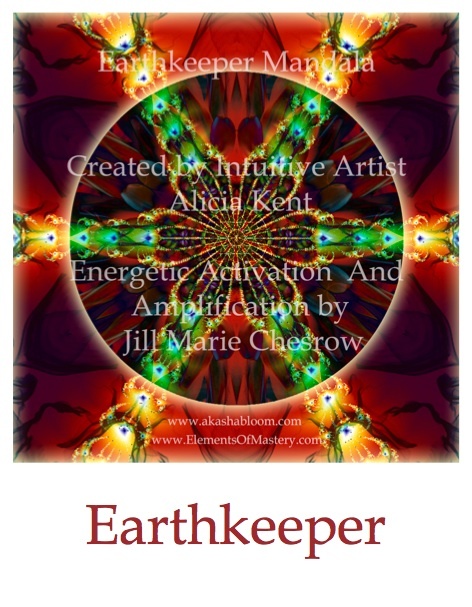 This mandala was created by Intuitive Artist Alicia Kent and Energetically activated by Jill Marie Chesrow to enhance the Earthkeeper energy for those that carry the Soul Energy of Earthkeeper and to aid Gaia/Mother Earth/Pachamama in the transmutation of any and all disharmonious, misqualitifed energy as we continue to heal and move into Peace on Earth. Great for use in your Personal and Planetary Healing Work, with your Prayer/Meditation time, or enhance the energetic space in your home or office. Also a great base for Crystal Grid work. This mandala is available for Download that you can print yourself. They are formatted on an 8 1/2 x 11 sheet of paper and will fit an 8 x 10 mat and comes with a PDF Reading Interpretation of the Energy Frequencies embedded within the Mandala.